I am afraid that this is the general perception – not only in Germany but across Europe. But note how terribly inconsistent the comment is – monetary policy doesn’t work, but at the same time monetary easing is very dangerous (inflationary). If monetary policy does not work why would it be so dangerous to ease monetary policy? The Handelsblatt also repeats the common fallacy that the level of interest rates tell us anything about whether monetary policy is easy of tight. Interest rates is NOT the price of money. The interest rate is the price of credit. Whether money is cheap or not is a matter of money demand vs money supply. Money demand still remains extremely elevated in the euro zone and money supply is extremely weak. Hence, monetary conditions are extremely tight – and this is exactly what the market is telling us. When German bond yields are extremely low it is exactly a reflection that monetary policy is TIGHT. As Milton Friedman used to say – interest rates are low when monetary policy has been tight. Besides that monetary conditions should of course be VERY EASY given the massive deflationary pressures, historically high unemployment and a very large negative output in the euro zone. Europe is not on the verge of hyperinflation as the Handelsblatt seems to think. Europe is on the verge of deflation and anybody who have studied German history should understand the grave political and social dangers of deflation and for those who have a hard time remember here are the facts. In 1923 Germany had hyperinflation. 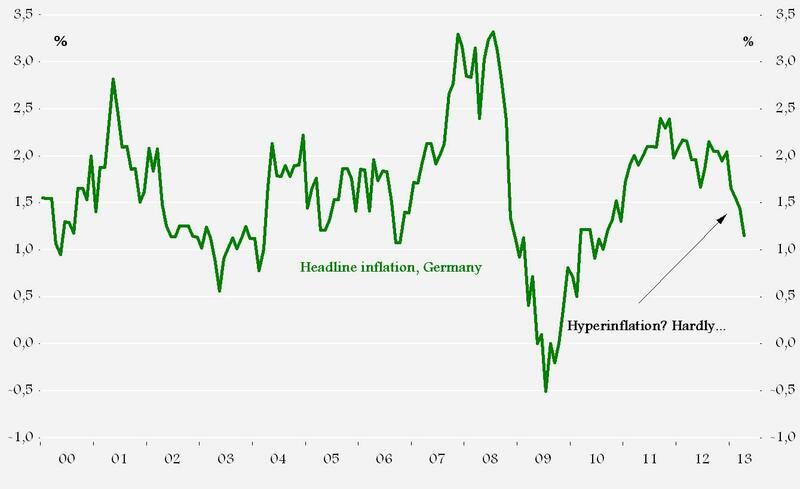 10 years later Germany was struggling with serious deflation and high unemployment. That brought Hitler to power – not easy monetary policy. PS I did not read the entire Handelsblatt story and my comments should be seen as a general comment on the state of economic and monetary debate in Europe and I readily admit that I am greatly frustrated by the fact the powerfull interests are keeping the ECB from taking appropriate action to end this crisis. It is very easy to do. PPS I suspect that the German fear of monetary easy really is not about monetary easing, but about bailouts. However, monetary easing is not a bailout. And by MM criteria, this rate cut didn’t even easy policy much. DAX is still off the March high and the EUR fell only modestly, I see this morning that EUR is on its way back up too. EUR is stronger because Nowotny told media that markets jumped on conclusion on interpretation that DF might go into negative territory. I was looking at EA GDP Deflator yesterday – its been under 1,5 (around 1,3%) since 2009. Since countries are (finally) done with tax increases HICP took a turn too, for the worse. It is very odd. Jorg Asmussen brought up a quote from The Economist which said “the pessimists did not overestimate the Euro’s problems, so much as underestimate the political will to do enough to stop a break-up.” He responded, “And anyone who continues to underestimate this will turn out either very wrong, or if you are an investor, very poor.” Unfortunately he’s right! There does seem to be a tremendous amount of political will to do JUST ENOUGH to keep the Euro together, but not nearly enough to make it a success. If I had to guess, this will continue to be a slow-moving crash. But at some point, I think the odds are it will indeed crash. Ravi, I am afraid you are right – the euro is not going to blow up in the near-term, but the ECB is doing nothing to ensure that we fundamentally move out of the crisis. That is basically a Japanese scenario. The problem, however, is that the political risks increases day by day. Youth unemployment of more than 50% in both Greece and Spain is extremely dangerous and I certainly worry that there are people in uniform who have been elected to parliaments across Europe. Lars. Although you are pessimistic about the Euro the movements in the peripheral long bonds indicates that the markets believe that those countries once again have a lender of last resort behind them. Credit spreads versus the bind have come down enormously. And today when “good news” on jobs from the US caused a spike in long bond yields around the world, those peripheral country yields rose too, because of recovery hopes, not credit fears for once. Some market participants speculate that even if the ECB is not easing, enough other countries are, like Japan, US and UK, and that the spillover could help the Eurozone. Perhaps just like Germany was helped out in the 1990s and early 2000’s by the boom in the rest of Europe. I know the deflation trends are horrible, but maybe help is at hand from non-Eurozone countries. James, you are very right. I am quite optimistic on the outlook for risky assets due to what we are seeing from the Fed and BoJ – and likely soon from BoE. In that sense I think we can compare the present situation with 1933-36. A period where monetary easing primarily from the UK and the US helped the global economy recover and risky assets in general performed well. Even the gold bloc – countries like Austria, France, Poland, Belgium and the Netherlands – saw stabilization and there where no sovereign defaults from 1933 to 1936 (Poland defaulted in 1936). So in that sense I am optimistic that the fed and BoJ will helping us in terms of the euro crisis right now. My worry would be what happens when Fed hits 6.5% unemployment and BoJ hits 2% inflation. At that time the euro zone could get into serious trouble again. But again you are right – the fed and the BoJ’s action mean that the euro zone will not blow up in the near-term and we might even see euro zone growth pick up slightly in the coming year. The Euro is a bad idea. Every nation needs control of the money printing presses; it is a sovereign responsibility. Now some guy in Greece or Spain: How is he supposed to vote? The most important macroeconomic lever—monetary policy—is controlled where? How is this democratic? Forget the euro. The sooner it tears asunder, the better.